How would you love to have the most beautiful earrings on the planet? These beautiful 6mm heart shaped earrings are so elegant; they will have people falling all over you or your loved ones, asking where on earth did you ever find such a gorgeous pair of earrings? These amazing Garnet studs are fitted with 14K Yellow Gold, which really gives the jewelry a traditional and classic look; you can never go wrong with classic jewelry! These earrings are also secured with a push back, which is great for holding them in place while you party all night long. The backs are also great in preventing any pinching or uncomfortable feelings since you can determine how tight you have them on, or even how loose you have them, depending on what your preference is. 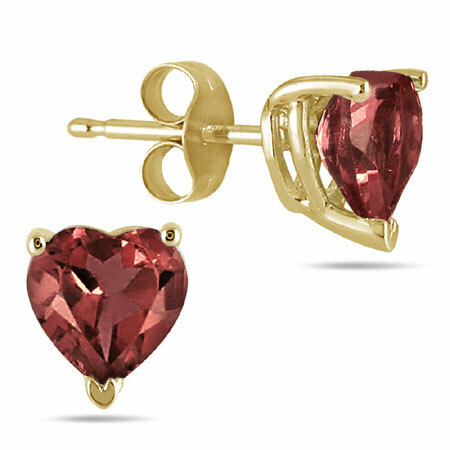 We guarantee our 6mm Heart-Shaped Garnet Stud Earrings, 14K Yellow Gold to be high quality, authentic jewelry, as described above.